Another beauty Laura! Snuggle in!!! Thanks, Jodi. It’s just started and already I can’t see the deck! arghy lol….. Thanks, Rebecca, it’s nice to hear you say this because I was thinking I should try it more often. I do love the precision of the finer tips, but the light and dark quality of the ball point can’t be underestimated. Thanks for your comment! Thanks! Yeah…..just started and already covering the deck. First snowfall of the year and a doozy! I better run out to the grocery store! Yes it was. No going out at the moment!! It’s amazing you drew that with just a simple pen. I like the nose. Thanks, Laura. It was just a quick one…..it’s not always easy to find something to post every day. Glad you like it. The pen is pretty cool, surprising how well it works when most art supplies cost so much. I love that you are capturing a variety of faces. Isn’t the ballpoint pen fun to use? Have you tried some of the colors in ballpoint? To control those little black specks of ink from the pen. Keep wiping the tip with a tissue or on a pair of dark jeans! Or go back with a fine tip white gel pen and gently touch the back specks. Keep going with ballpoint one of my favorite tools! Thanks for the tip, Carmel! I really haven’t played with ballpoints much at all because I still prefer the precision of an extremely fine tip. But I think I really need to consider using them more! Glad you like them so much, that makes me wanna give them more of a chance! Thanks, Kirk! Gotta love the simple pen & pencil. Nice texture from the ball point Laura. I just splurged and bought myself the Lamy Al-star fine point pen. I’m loving it. Stay warm dear friend! I bought the Lamy fountain pen, so I didn’t have to buy so many drawing pens, that seem to run out of ink quickly. Especially with all of the pen art I make. I bought mine on Amazon. I hear ya. The Copic set I just bought (after Blick sent me a free sample, for which I’ll love them for eternity) is refillable. And the nib is replaceable. The smallest nib is 0.03 mm. It’s hard for me to contemplate just how tiny that is! And there are much larger ones too. So I’m going on with those for the moment, but I’m always curious what else is out there that I’ve never tried. You never know til you try something how it’ll strike you. I almost didn’t try pens or portraits! And both seem to work for me. So now I’m more likely to give things a try when normally I would stick with the tried and true. Are they all basically the same, Sharon, just different brands? I feel like there are tons of different kinds of pens, and I’ve only just scratched the surface. I love it….hares, hares and more hares, he works really well in the ball point pen, really great choice, simple tools work well, and you have shown this to great effect. 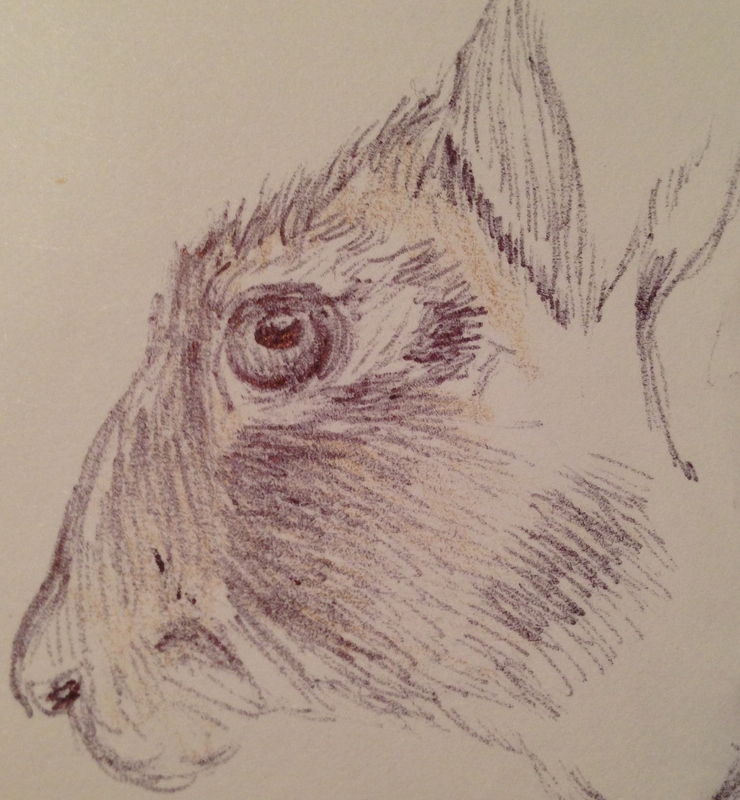 I am working on another hare painting at the moment, hare therapy! I had a feeling you might like this one, lol! Thanks, Rebecca. Yeah, the trees/bulbs are all confused. Ours seem to know it’s winter now since we’ve been in the deep freeze for a few weeks but we had 70s around Christmas! It was crazy! It keeps me producing at the level I want to produce, Jill, which is why I keep doing it. I need more practice, and with a goal to come up with something worth posting daily……helps spur me on. I can totally see both sides, and I’m glad it’s working for you. I’m still feeling my way, as I enjoyed a total break too. It’s hard for me to be in the middle. I’m an all or nothing sort of person. 💛 Glad you enjoyed the bunny. I love them! Furry creatures are the coolest. Ballpoint sounds like a good idea…. hope you survive the blizzards ok. We tend to get the tail end over here! Thanks, Nexi. I hope this one blows far far from you. You put soul in its eye! It remind me a bit of a Durer. Pretty! I think it is a hare Laura and you certainly capture a soulfulness in the face. They are solitary animals here sometimes in pairs and they always look sad, mainly because they are hunted I guess. I look at them with binoculars, Charlie has other intentions!! Lol, I bet she does! They do always look sad; you’re right, Denis. There’s definitely a wariness there in the eyes. I’m glad you enjoyed it!